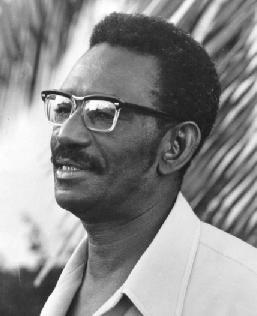 The 7th February marks the 24th anniversary of the death of world renowned multi-disciplinary scholar and Pan Africanist, Dr Cheikh Anta Diop. Diop was born on December 23, 1923, in Diourbel west of Senegal. His mother tongue is Wolof. He came from a Muslim peasant family and attended Koranic schools. Diourbel was the seat of a strong Muslim sect, the sect of the Mourides, the only Black African sect which succeed in acting independently from the rest of the Muslim world. He played an important part in organising the first recorded Pan Africanist Student Congress which was held in Paris in 1951. Cheikh Anta created his own philosophy of African life and history on the basis of rigid scientific investigations which were clearly manifested in his startling Nations Negroes et Culture (Black Nations and Culture) published in 1955. For his doctorate, he presented a lengthy and closely argued dissertation on ancient Egyptian history the same year (1955). The title of his thesis was Black Nations and Culture: From Black-Egyptian Antiquity to Cultural Problems of Black Africa Today and Spady says it was arrogantly rejected by the “savants” at the Sorbonne. Nations Negres et Culture was published by the editorial staff at Presence Africaine in 1955. This was a watershed in African history written from an African perspective. Spady says the book served as a cultural machine-gun blowing away all the falsifiers of African history. In January 1960 Diop appeared again before the jury of examiners at the Sorbonne. He carried with him a room full of Black scholars and students from various disciplines. He defeated the French intelligentsia on their own ground – the Sorbonne and earned his Doctor of Letters degree D.Litt. He went back to Senegal. Diop was also a Nuclear Scientist. He worked hard to build the Radiocarbon laboratory at IFAN in Dakar. It was established in 1966 for the purpose of low-energy radioactivity research and carbo-14 dating. In 1966 together with WEB Du Bois were honoured as African/Black people who influenced many Africans and people of African origin in the world. His paper when he was still a student, Towards An African Political Ideology reflects an evolved Pan Africanist perspective. It consists of 14 major steps and an extensive explanation for implementation. He has authored several books like African Origin of Civilisation: Myth or Reality; The Cultural Unity of Africa; The Economic and Cultural Basis for a Federated State in Black Africa; Precolonial Black Africa and Civilisation or Barbarism which I was fortunate to have read them all and reviewed almost all for a Botswana weekly newspaper, Mmegi/The Reporter. Diop died in his sleep on 7 February 1986. Paying tribute to Diop, Prof Van Sertima said, “His passing is a great blow to us. Yet history teaches us that men like these do not die at the time of their deaths. Often it is that the fall of a great teacher or prophet is the beginning of the rise of his ideas. So let it be with Diop”.